What has approximately 30,929 stitches and is complete. My first PHD (Project Half Done).Hurrah!! On February 28th, I finally finished my Lake Louise PHD (Project Half Done). I can't even remember when I started this project. It has traveled a lot with me; it has been to Tucson a couple of times and has gone camping with me and for many drives into the country with my husband. I know that I bought it from the Beehive stitching store that was down by Chinook Centre. Those that remember that store know it burned down a long time ago. Finishing this project is a bit bittersweet, it has been like an old friend who knows all my secrets and never complains if I don't work on it, it is always there just waiting patiently for me to pick it up. When I joined the CGNFA they proposed a PHD program to finish the projects that don't seem to get done. This is one I chose because I felt I really needed to finish it. A holiday in Tucson is conducive to lots of stitching. So thank you Lake Louise for being there for me and now all I need to do is, clean you and get you framed. I promise to do that when I get back to Calgary. So now while I say good bye to this project I now say, "time to work on you, Celtic Banner, you have been sitting in my closet way too long". This is a lovely piece Pat. 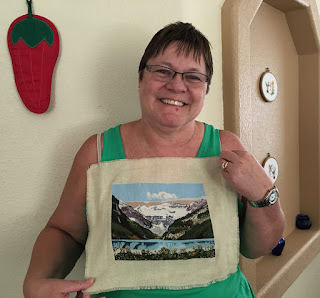 If going to Tucson is the way to get stitching done, it seems that I'll need to take a trip soon! Way to go Pat! Lake Louise is a beautiful finish!